All Seasons Air Conditioning Co., Inc.
As your trusted comfort specialist, we are committed to being the best in installation, service and customer satisfaction. No job is too big or too small—you’ll get speedy, high-quality, and dependable service. We offer top-notch heating and cooling services from installation and replacement to repair and maintenance at the most competitive price. For all your residential and commercial heating and cooling needs, our team is the company you can trust. All Seasons Air Conditioning is committed to providing consistent quality services, one customer at a time, every time. 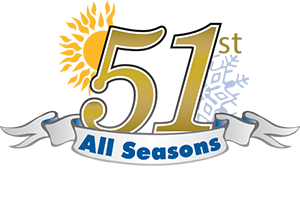 For more than 51 years, we never fail to give excellent workmanship and unrivaled customer services to all our residential and commercial clients in Nassau County, Suffolk County & Fire Island, NY. We do sales, service, and installation of well-known brands of heating and cooling systems – Daikin, Carrier, Mitsubishi, and Aprilaire. Our licensed technicians are well-versed of the basic and advanced solutions to all your heating and cooling needs, be it installation, repair or maintenance. We also offer a wide range of air quality products that are proven effective in keeping a healthy environment inside your home or workplace. Whatever you need for your heating cooling and indoor air, we have a variety of high-quality products that you can choose from. Schedule an appointment with our professionals and join our long list of satisfied customers.